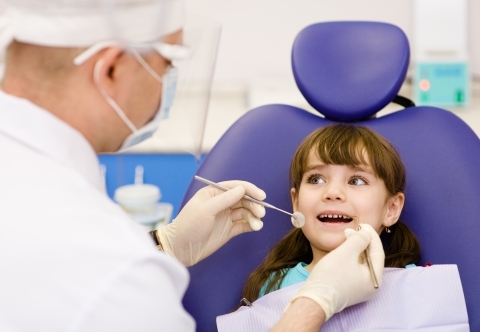 If Your Child Has a Toothache: Clean the area of the affected tooth thoroughly. Rinse the mouth vigorously with warm water or use dental floss to dislodge impacted food or debris. If the pain still exists, call our office. DO NOT place aspirin on the gum or on the aching tooth. If your child’s face is swollen, apply cold compresses and contact our office immediately. If the office is closed because it’s a weekend or evening, page the doctor and keep your phone nearby so you can describe your child’s condition precisely when the doctor calls back. If Your Child Cuts or Bites His/Her Tongue, Lip or Cheek: Apply ice to the bruised areas. If there is bleeding, apply firm but gentle pressure with a gauze pad or clean cloth. If bleeding does not stop after 15 minutes or it cannot be controlled by simple pressure, take your child to the nearest hospital emergency room. If One of Your Child’s Permanent Teeth is Knocked Out: Find the tooth. Handle the tooth by the crown (the top part), not the root portion (the portion normally unseen). You may rinse the tooth, but DO NOT clean or handle the tooth unnecessarily. Inspect the tooth for fractures. If it is sound, try to reinsert it in the socket. Have the patient hold the tooth in place by biting on a piece of sterile gauze. Call our office immediately and alert the office or page the doctor. Your child will need to be seen as soon as possible. If you cannot reinsert the tooth, transport the tooth in a cup containing the patient’s saliva or milk. If the patient is old enough and won’t swallow the tooth, the tooth may also be carried in the patient’s mouth. But don’t delay – your child must see a dentist IMMEDIATELY! Time is a critical factor in saving the tooth. If One of Your Child’s Permanent Teeth Is Chipped or Fractured: Contact our office immediately and page us if it’s after hours — your child will probably need to be seen as soon as possible. Quick action can save the tooth, prevent infection and reduce the need for extensive dental treatment. Rinse your child’s mouth with water and apply cold compresses to reduce swelling. If possible, locate and save any broken tooth fragments and bring them with you when you come to the office. If One of Your Child’s Baby Teeth is Knocked Out: Call us at the office or page us if it’s after hours. Usually no treatment is necessary, but it’s worth a phone call to be certain. If One of Your Child’s Baby Teeth Is Chipped or Fractured: Call the office or page us if it’s after hours. In the meantime, make sure your child has no other injury. Often a lip may also be bruised or bleeding. Clean the area and apply cold compresses to keep the lip from swelling more. If Your Child Suffers A Possible Broken or Fractured Jaw: Keep the jaw from moving and take your child to the nearest hospital emergency room.It’s important to emphasize one point more than any other when it comes to accidents and children: the adult must make sure to watch for other serious injury such as a concussion. If your child experiences any loss of consciousness or nausea, go to the nearest hospital emergency room IMMEDIATELY. We will worry about your child’s teeth later as a secondary issue.